Farmers Markets can be a great warm weather destination that saves money and provides you with fresh, nutritious food. Here are some tips to make it a worthwhile experience. First, enjoy your day and take time to soak it all in. The sights, sounds and smells should all contribute to a pleasant activity. Add in the knowledge that your fresh food purchases help both your local economy and the environment. Talk with the farmers. They’re usually eager to talk about their products and often have other valuable information or a free sample to share. Get there early for the best selection. Arrive near closing time for the best bargains, when farmers are eager to clear out their inventory (while it’s still fresh). Bring cash. Some markets are equipped with ATMs and a few vendors take plastic, but cash is your safest bet. Finally, plan on bringing your own bags. Fruits & veggies can be heavy and it’s in your best interest to tote them in something that won’t easily tear on the way to the car. 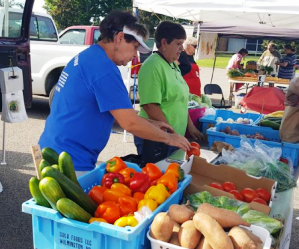 Here in Sanford, the Sanford Farmers Market is open on Saturdays from 9am to noon, from April through October at the McSwain Center, 2420 Tramway Road, near Southern Lee High School and SanLee Middle School. The market always offers a wide selection of fresh products direct from area farms, including produce, baked goods and much more. Every booth is staffed by the farms who actually grow and produce their products. No buying or reselling is permitted. And of course, the selection changes with the growing seasons, so it’s a good idea to drop by on a frequent basis. This time of year, you’re likely to find a full selection of watermelons, blueberries, jams & jellies and lots of veggies. 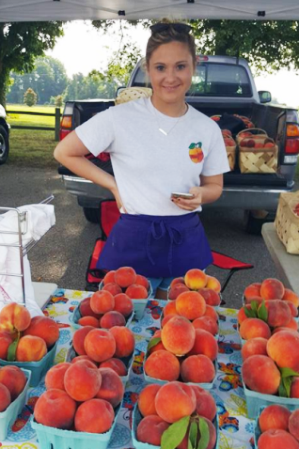 You can keep up on weekly activities and market news at the Sanford Farmers’ Market Facebook Page, and for links to growers’ markets throughout central North Carolina, in communities such as Pittsboro, Spring Lake, Carthage and Pinehurst, you can visit the Department of Agriculture’s NCFarmFresh Website.